24 mm polished stainless steel and 18K red gold case, domed scratch-resistant sapphire crystal with anti-reflective treatment inside, silver dial, quartz Omega 1376 movement, approximately 32 months of power reserve, stainless steel and 18K red gold bracelet. 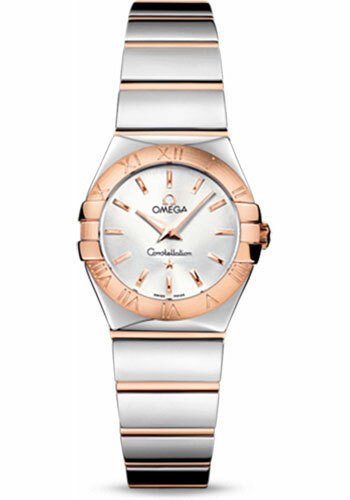 Water resistant to 100 m.
24 mm polished stainless steel and 18K red gold case, domed scratch-resistant sapphire crystal with anti-reflective treatment inside, white mother-of-pearl dial, quartz Omega 1376 movement, approximately 32 months of power reserve, stainless steel and 18K red gold bracelet. Water resistant to 100 m.
24 mm polished stainless steel and 18K red gold case, domed scratch-resistant sapphire crystal with anti-reflective treatment inside, white mother-of-pearl dial with diamond hour markers, quartz Omega 1376 movement, approximately 32 months of power reserve, stainless steel and 18K red gold bracelet. Water resistant to 100 m.
24 mm polished stainless steel and 18K red gold case, domed scratch-resistant sapphire crystal with anti-reflective treatment inside, brown shell dial with diamond hour markers, quartz Omega 1376 movement, approximately 32 months of power reserve, stainless steel and 18K red gold bracelet. Water resistant to 100 m.
24 mm polished stainless steel and 18K red gold case, diamond bezel, domed scratch-resistant sapphire crystal with anti-reflective treatment inside, white mother-of-pearl dial with diamond hour markers, quartz Omega 1376 movement, approximately 32 months of power reserve, stainless steel and 18K red gold bracelet. Water resistant to 100 m.
24 mm polished stainless steel and 18K red gold case, diamond bezel, domed scratch-resistant sapphire crystal with anti-reflective treatment inside, white mother-of-pearl shell dial with diamond hour markers, quartz Omega 1376 movement, approximately 32 months of power reserve, stainless steel and 18K red gold bracelet. Water resistant to 100 m.
24 mm polished stainless steel and 18K red gold case, diamond bezel, domed scratch-resistant sapphire crystal with anti-reflective treatment inside, brown shell dial with diamond hour markers, quartz Omega 1376 movement, approximately 32 months of power reserve, stainless steel and 18K red gold bracelet. Water resistant to 100 m.